Original Antique Maps and Prints. Artists and Engravers: Made by'Jakob van Schley' after'Jacques Nicolas Bellin'. His career,ning over 50 years, caused an enormous outpt in maps, particular of maritime interest. Subject: Antique print, titled:'Carte de l' entree de la Riviere de Sanaga ou Senegal. 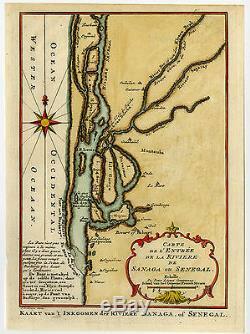 A map of the mouth of Senegal river, near the city Saint Louis in Senegal. Condition: Size (in cm): The overall size is ca. 17.4 x 24 cm. The image size is ca. 16.5 x 23.2 cm. Size (in inch): The overall size is ca. 6.9 x 9.4 inch. 6.5 x 9.1 inch. Medium: Handcoloured etching/engraving on laid paper. ThePrintsCollector Peter Cornelissen, Margo van Latum - van Dongen, Frank van Latum Zeeland - The Netherlands. We guarantee our items to be genuine original. GO TO OUR STORE and explore our huge collection of fine antique maps and prints. FIND SIMILAR ITEMS IN OUR STORE. Visit our Store: we would like to invite you to review similar items in our Store or to browse through all other items in our Store. We are confident that you will find very special unique antique maps and prints in our Store. It is our privilege to have you as a customer. The item "Antique Print-MOUTH-RIVER SENEGAL-AFRICA-Schley-Bellin -1758" is in sale since Friday, November 27, 2015. This item is in the category "Antiques\Maps, Atlases & Globes\Africa Maps".